For the best results, a social media content plan can really help you understand what you plan on sharing with your fans, determine why it’s important to them, and successfully distribute content to your fans. In this blog, we’ll discuss the 4 key elements of a social media content plan and how you can accomplish one. 1. What Is the Goal of Each Social Media Channel? In order to start planning out your social media content, you need to have a distinct reason to publish content on each channel. “To gain followers” is not a reason. However, “To gain followers to drive brand awareness and traffic back to my site” is a good reason. You want to make sure your content on the channel serves a purpose and takes your fans to the next step in the buyer’s journey. 2. What Action Do You Want Fans to Take? Like the first point, what is the ultimate goal you wish your fans would accomplish? Clicking through to your website? When you determine a desired action, you can create posts that will encourage fans to take that specific action. Do you want to spread awareness about an upcoming event? Create a Facebook event and encourage your fans to share that event or invite your personal Facebook friends to it. 3. What is the Appropriate Tone You Plan on Using for Each Channel? What is the tone you should be using for Twitter? Facebook? LinkedIn? Instagram? All social channels have very different audiences and the tone can vary tremendously from channel to channel. For instance, a LinkedIn user is more likely to be a professional looking for content related to their career, while an Instagram user may be a younger, care-free individual who is looking to be inspired by graphics. 4. How Often Do You Want to Post on Each Social Media Channel? 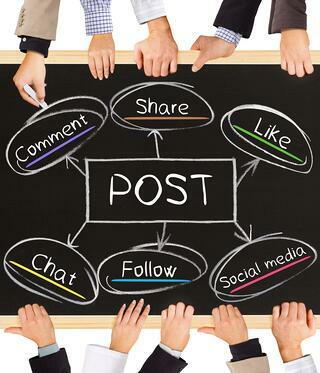 Determining how often to post, and how post frequency varies on different social channels, is key. For example, Twitter is an ongoing stream of conversations. Tweets can easily get lost, therefore it’s smart to post several times a day on this social network, unlike Facebook where one post a day may be sufficient. Anything more than one post a day for social media channels like Facebook may hurt your fans’ experience because you could be clogging up their news feed. It’s also important to focus most of your effort on the social channel that’s best for your target audience. Does your target audience interact more with pictures than they do stories? Then you may want to consider focusing most of your social media efforts on Instagram, rather than Facebook. Just starting out on social media for your business? Check out this awesome and FREE infographic on how to establish your brand on social media!